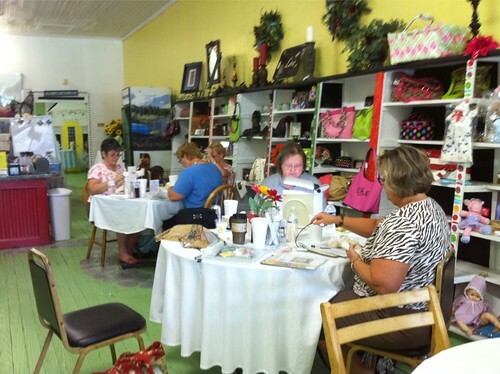 I went to Manning, SC for a stitching get together yesterday and had so much fun. It was so nice to get away (by myself) for a day. 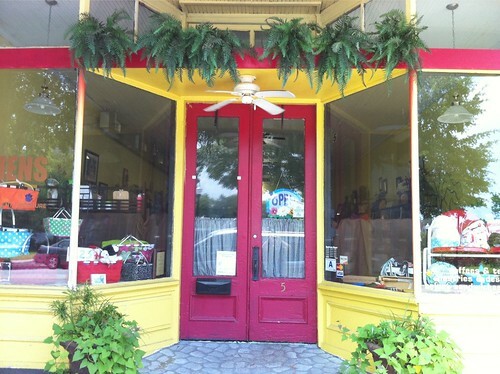 Amy from Down Sunshine Lane planned a wonderful day for us at The French Hens, an adorable restaurant in downtown Manning. We stitched for awhile and then they served a delicious lunch (I had a chicken salad sandwich on a croissant) and then we stitched some more. I was working on shores and I made a little progress on block 11. Sorry for the not so great photos - they were taken with my camera. I will try to get some better stitching pics later today. This get together was just what I needed to get me out of my slump. When I got home I worked on shores some more and then I decided to start something new. 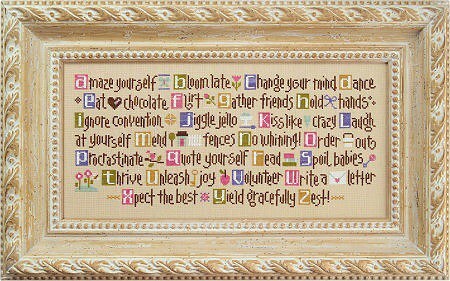 I started Lizzie Kate's ABC's of Aging Artfully (which I think should actually be called "Life Lessons Two"). It's such a cute design. I'm using 40 ct. Vintage Pearled Barley by Lakeside Linens and I'm changing some of the colors. I'll post more about it when I can. Well, it's almost 5 am (I woke up around 3 something) and I can't get back to sleep - thanks to a four year old who has trouble staying in his own bed! :) Write soon! I love hearing about those fun stitching get-togethers you have, Nicole. They're a great idea to get you motivated. Glad you had fun at the get together. Shores is looking great! I remember those days of little ones not staying in their beds. Such fun. lol! Sounds like a fun get together Nicole! Great progress on Shores! I love the progress on shores. The fabric you are using is fabulous. As for little ones waking you up we had the same problem. The pediatrician recommended that we allow our son to come in and sleep on the floor and explain that he wasn't to wake us up. So each night I left pillow and blanket next to my bed, each morning I found my sleeping baby on the floor. NOTE: each morning. I slept great, he slept great and eventually outgrew it. Your progress on Shores is looking great. I like the block with the bottle in it alot. Great to see you too! Can't believe you started something new last night.....have fun stitching. Hope you get a nap today too....5:00 am???? Sounds like a fun day! Shores is looking awesome. I hope you're able to get some rest. The days of my boys not staying in bed are long gone - now I can't pry them out of bed! Glad you were able to have a day to yourself and got to spend it with your stitching friends. Shores looks wonderful and I like the LK design you've started. The stitching group sounds like just what you needed. The Shores is coming along nicely. Looks like a fun get together! Your Shores is looking fabulous! Oh, that looks so fun! Yay for getting past the slump! You deserve a nap today. 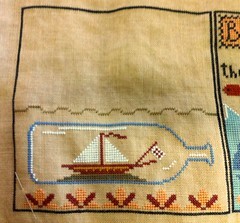 Or more stitching! My son has a hard time sleeping in his own bed, too, but he's like sleeping with a blender so nobody gets any rest. An air mattress on our floor gives him a place to go when he comes in at night. It slides under our bed when not in use. Glad you're out of your slump Nicole. Looks like your get together was such a fun time. Of course now I'm craving chicken salad on a croissant! It WAS such a fun day and I was so glad to see you and the rest of the gang. Seeing your shores piece in person is just too nice! Only problem is, I want to get mine out and stitch it too and of course, there just isn't enough hours in the day to get EVERYTHING done - LOL! Hope to see you gain soon! Looks like a perfect day to me!!!! Glad you had so much fun :-). Shores is gorgeous and that's one of my favorite Lizzie Kate pieces. How fun! 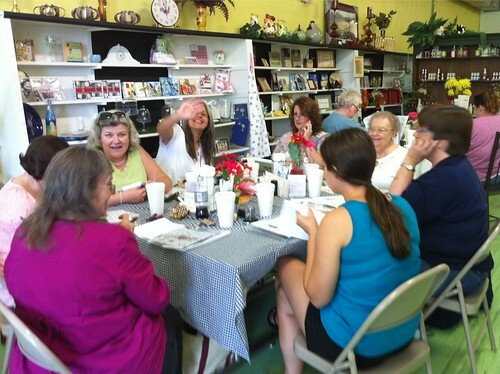 I love stitching get together and also enjoy hearing from other's group :) We never have enough beautiful inspirations! !